February 8, 2018 No Comments on Looking for a Sports bra that you can nurse in? 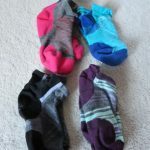 Smartwool socks – not just for winter! October 16, 2017 No Comments on Smartwool socks – not just for winter!